Sou | 2:07 AM Feel free to comment! Human activities are changing Earth’s climate...The atmospheric concentration of CO2 has increased ... caused by burning fossil fuels. The world has warmed by 0.8 Cº. Some (but not all) mountain glaciers have receded. Arctic sea ice has declined since 1979, but Antarctic sea ice has increased. Climate models predict that global temperatures will continue to rise, with the amount of warming primarily determined by the level of emissions; that higher emissions of greenhouse gases will lead to larger warming and greater risks to society and ecosystems; and that some additional warming is unavoidable owing to past emissions. Climate change is not expected to be uniform over space or time. Deforestation, urbanization, and particulate pollution can have complex geographical, seasonal, and longer-term effects ... on temperature, precipitation, and cloud properties. In the current climate, weather experienced at a given location or region varies from year to year; in a changing climate, both the nature of that variability and the basic patterns of weather experienced can change, sometimes in counter-intuitive ways – some areas may experience cooling, for instance. Apart from the above, the rest is just another rehash of Monckton's normal nonsense, lies and disinformation so I won't say any more about it other than to selectively quote three WUWT readers. August 7, 2013 at 3:44 am Dear Lord Monckton, if only the world were a little saner. August 7, 2013 at 3:42 am I bow again to you M’Lord. August 7, 2013 at 7:20 am The atmospheric CO2 in 1958 was 0.0315% and has risen to 0.0395 in 2013, a rise of 0.008%. Isn’t it amazing that an increase of 0.008% in a gas that accounts for only 3.5% of the greenhouse effect is supposed to cause global warming of 6-10 degrees F by 2100? Even more amazing is that while CO2 rose from 0.0315% to 0.0338 from 1958 to 1980, global temperatures cooled, rather than increased, and the warmest decade of the century, the 1930s (unless you tamper with the data), occurred BEFORE atmospheric CO2 began to soar after 1945! But perhaps most amazing of all is how people who call themselves scientists (AGU) are willing to accept failed model predictions over real-time data. The arithmetic error: Denier Don talks of an increase as a percentage. 0.0395% minus 0.0315% divided by 0.0315% equals a 25% increase in the amount of atmospheric CO2 since 1958, not a 0.008% increase. The increase in atmospheric CO2 since industrialisation is now around 40% or more. 2. 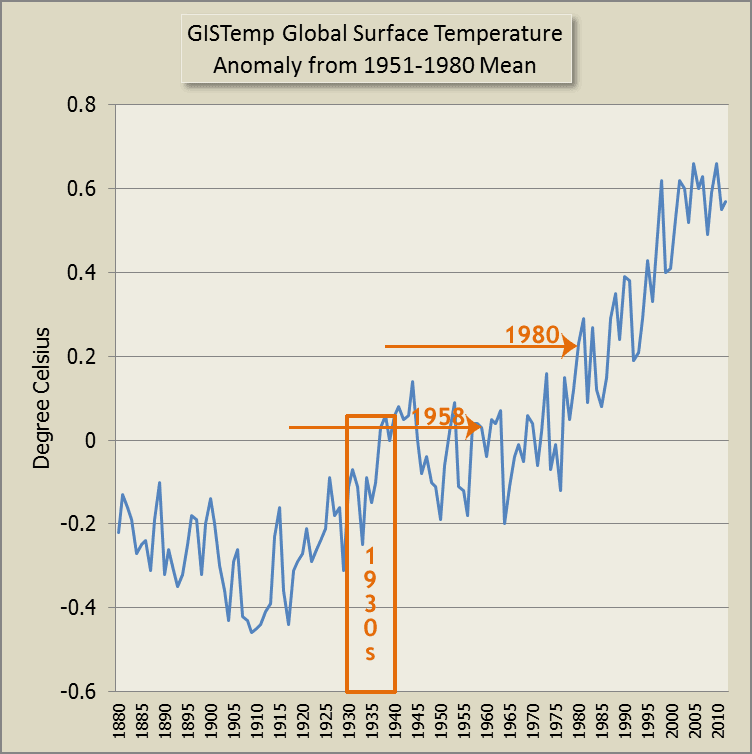 Global temperatures did not "cool" between 1958 and 1980. 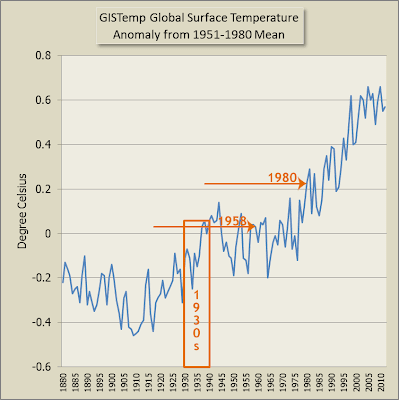 2010 was the hottest year on record to date, the decade of the 1930s was a lot cooler.